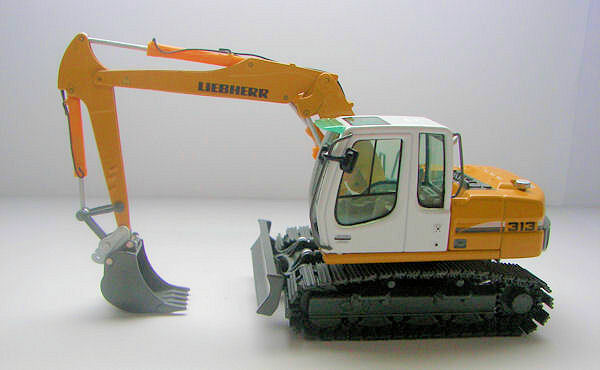 NZG produces the scale model of the Liebherr R313. The model comes in the well known cardboard box with a picture of the real machine. The model itself is firmly packed in a styrofoam box. Apart from the model a bag with spare parts can be found in the box. This bag contains four crawler pads, 2 metal pins and an extra set of mirrors. NZG reproduced the model very realistic. 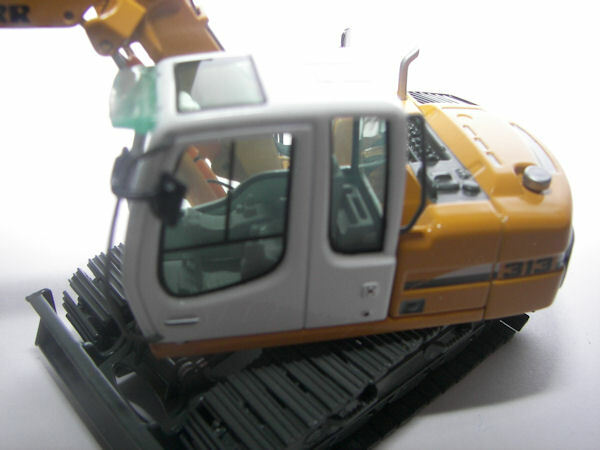 Details like hydraulic hoses, mirrors and warning decals together with the sharp colours give the model an impressive and realistic look. 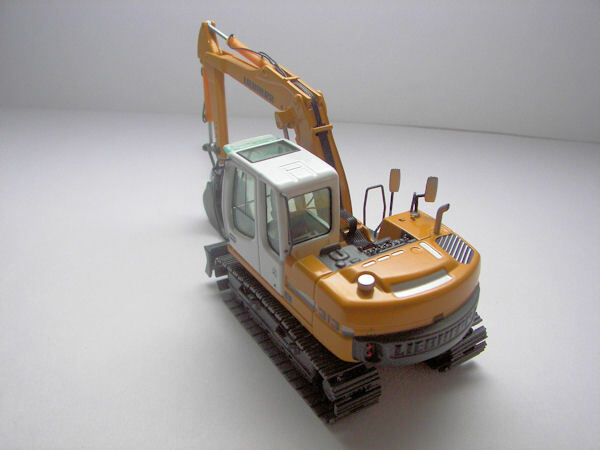 The model is equipped with separately linked tracks and a functional dozer blade. 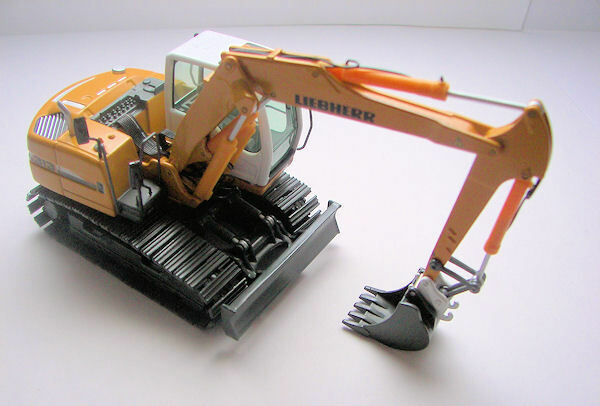 The bucket is connected to a quick coupler by the use of two pins, as NZG has done on various other Liebherr models. Also the cab interior has been nicely reproduced, though no colours are used on the inside. Attention was also payed to the back and top of the model. The counterweight has Liebherr casted in and the lights on the rear are painted. The casted grille and panels on top are printed very crisp, adding to the realistic look of the model. 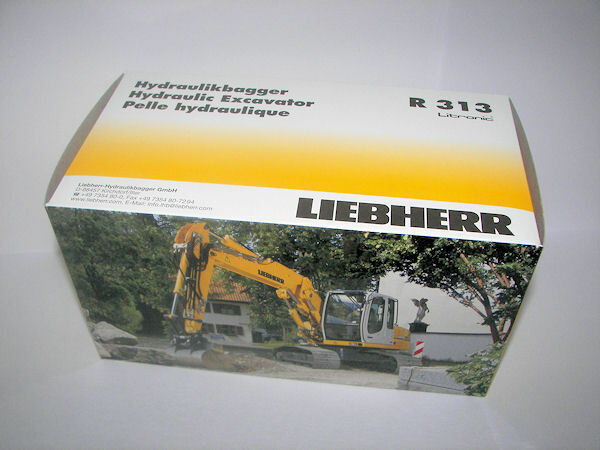 With the R313 NZG once again introduced a beatifully detailed model, which is a great addition to the available Liebherr earthmoving model range.